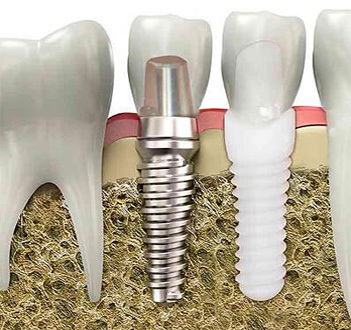 Dental implants are a gorgeous and extremely effective replacement for teeth that have been lost or severely damaged. Dentals implants can support crowns, bridges, or dentures, and provide many advantages over other teeth replacement options. With dental implants, patients will enjoy a look and feel more like real teeth. Patients with implants can eat normally, including foods that might be avoided with other prosthetic options. Implants are secured in place, requiring no messy adhesives. Appliances affixed to implants will not slip around or become loose. A benefit not always considered is that much of the natural structure is preserved, allowing the patient a more normal eating experience. Implants also provide patients with added health benefits. The implants are actually placed into the bone, providing stimulation, which helps with bone retention. Implants may be ceramic or titanium. Both materials are safe and compatible with the human body. The patient and dentist will discuss which option is more appropriate, and the patient will make the choice. 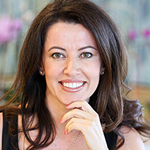 Dr. Sanda Moldovan is more than a dentist, she is also a periodontist and nutrition specialist. She conducts individualized consultations and performs surgical implant procedures for patients in her Beverly Hills practice. With her knowledge and experience added to the implant process, patients can depend on remarkable outcomes. Implants are the ideal solution for patients over 16 years of age, when their bone structure of the face stopped growing. The procedure is fairly simple and routine, and no complications are generally expected. For the procedure, Dr. Moldovan prepares the patient to ensure a comfortable and pain-free experience. Based on need, the appropriate number of implants are strategically placed using the most advanced equipment. Then the patient's restorations are attached to the implants, to complete the implant experience. At this point, the patient will be instructed on proper care to contribute to healing and ideal results. Over the next few months, the implants will be osseointegrated into the surrounding bone. A patient can then enjoy up to a lifetime of beauty and function with his or her dental implants. Patients with missing teeth or desiring to replace failing teeth are encouraged to schedule a consultation with Dr. Moldovan to discuss dental implants. The most natural replacement option for function and beauty waits for the dental implant patient.